Join our two hour small group guided tour of the National Museum of Art. A trip to an art museum can be overwhelming. What do you focus on? What are the must-see pieces? Stephen Mead will take you through the National Gallery of Art's highlights, historical showstoppers and fan favorites over the course of two hours. He will stop to discuss each piece's symbols, stories and background. You will see 40 plus choice artworks that visually are the finest from the Renaissance, 18th Century, and Medieval Art periods. With each piece Stephen will point out the symbols, stories, and reason why the artists painted the art work. The group will meet inside the National Gallery of Art West Building Ground Floor 6th and Constitution Avenue NW, Washington, DC 20516. The tour will go from 1:00 pm until 3:00 pm. Adventures for Creative Tourists is not an affiliate of the National Gallery of Art. We are an affiliate of the Guild of Professional Tour Guides. 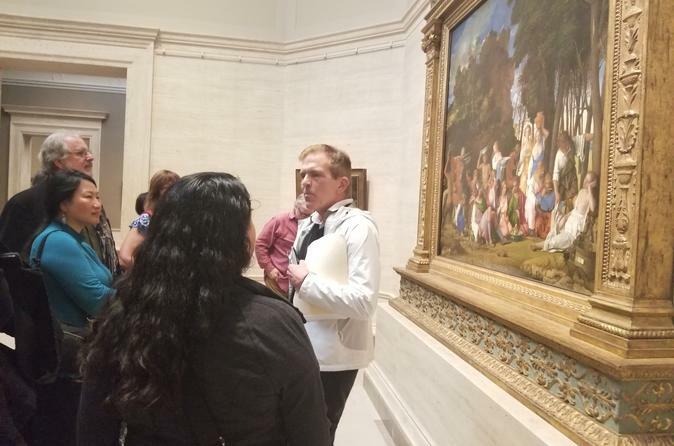 Your group will meet their tour guide inside the National Gallery of Art West Building entrance at the 6th Street Entrance Ground Floor at 1:00 pm. Please plan to arrive 15 minutes early. Your tour guide will take you first upstairs to visit the Rotunda. Next, you will begin your journey with Medieval Art that are among the best examples from this period. Your guide will then take you into Renaissance, 18th Century and more showing you the best art examples. At the end you will understand some of the symbols, colors, and stories behind these magnificent pieces There are over 40 plus art pieces that will be viewed by this tour. This tours run time is from 1:00 pm to 3:00 pm.